The story is interesting and does a great job of revealing itself within the run time. I admit that I take breaks when watching movies on Netflix as it’s the luxury of streaming movies at home and IO paced itself remarkably well for me to find moments to hop our and hop back in. The set design was really interesting as there are little clues and details about the research that Sam is conducting as well as tidbits about the whereabouts of her father. They’re small details but eagle eyed watchers may re-watch this movie for those clues to have an understanding of Sam’s state of mind when she meets Micah. The assumption is that she’s just lonely when in fact she’s continuing the research. 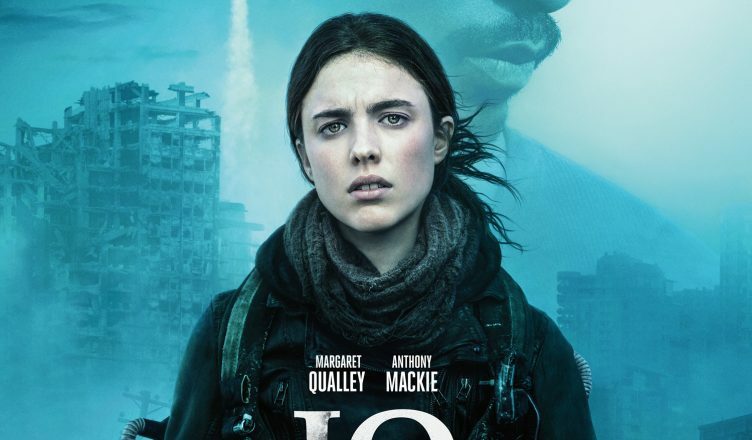 Anthony Mackie and Margaret Qualley perform pretty throughout the movie. These aren’t homerun performances but they don’t drag the movie by showing little interest in the role which is a trap far too successful with actors these days. I felt that Anthony Mackie was showing some genuine effort in his role but there’s only so much one can praise when you notice that they don’t wholly create their character for the film. It’s not like either is adopting an accent or supplementing with physical mannerisms unique to the character they portray but the fact that they don’t deter from the film is a compliment to IO in itself. The premise sounded interested enough to check out but the movie itself fails to satisfy. There are a lot of ideas talked bout and touched on that I would have loved to have seen in a post apocalyptic movie but IO instead shies away from those things. We learn that IO is instead one of those…. CHARACTER STUDIES! We discover this fact when it’s noticed that there are only 2 people in the entire film movie. A 3rd person is implied but only offers a voice over rather than making an appearance within the movie. This would be fine if IO did more to make itself interesting but that’s not the case. There’s the idea that we may learn more of how humanity is surviving in this new world that’s not revealed and that’s a shame. IO can be boring. t’s not that IO is a bad premise, we’ve seen movies and TV shows that have a similar premise and work, it’s just that IO doesn’t explore it’s more interesting concepts. IO isn’t bad aesthetically either as the movie is beautifully shot and filmed. IO avoids the traps of bad acting as the 2 and a half people involved with delivering the narrative to the audience did just that pretty well. IO is just plain boring and that’s bad for the movie fundamentally, which is also disappointing.